Armando Antonio Galarraga Barreto was born on January 15, 1982 in Cumaná, Venezuela. He took to playing baseball, excelling as a pitcher. He must have dreamed of one day playing in the big leagues, since that’s the dream of every boy in Latin America. In 2008, at age 26, Armando was drafted by MLB’s Detroit Tigers. On June 2, 2010, Armando Galarraga was scheduled to pitch against Detroit's division rivals, the Cleveland Indians. Armando pitched three perfect innings for the Tigers. Then he pitched a fourth perfect inning. Then a fifth. Then a sixth, seventh, and eighth. There was only one inning to go. To-date, in its 130-year history, MLB has had only 299 all-time no-hitters pitched in over 400,000 total games. That means pitching a no-hitter has only occurred 0.075% of the time, or one out of every 1337 MLB games. But a no-hitter wasn’t what Armando Galarraga was on pace for. He was on pace for something even more elusive: a perfect game; meaning, a no-hitter, yes; but also not allowing a single walk; no opponent ever reaching first base. So, although there have only been 299 no-hitters ever pitched, there have only been 20 perfect games ever pitched; one out of every 20,000 games. Armando’s outing was about to become the games’ 21st. Pitching a perfect game meant that he’d be on the front page of newspapers, the top story on the Today show, Good Morning, America, and most assuredly, a lucrative contract extension. Pitching a perfect game meant his life would never be the same again. As he took the mound for the ninth inning, Armando retired the first batter; then the second. He needed only one more out. As he faced his final batter for the Indians, rookie Jason Donald hit a ground ball to first baseman Miguel Cabrera, who scooped up the ball as Armando ran to first base to take the throw. The throw by Cabrera was perfect. The catch by Armando was perfect. All that was left to do was for Armando to step on the base. It was a close play, but Armando reached the base before the runner. It was the final out of a perfect game. 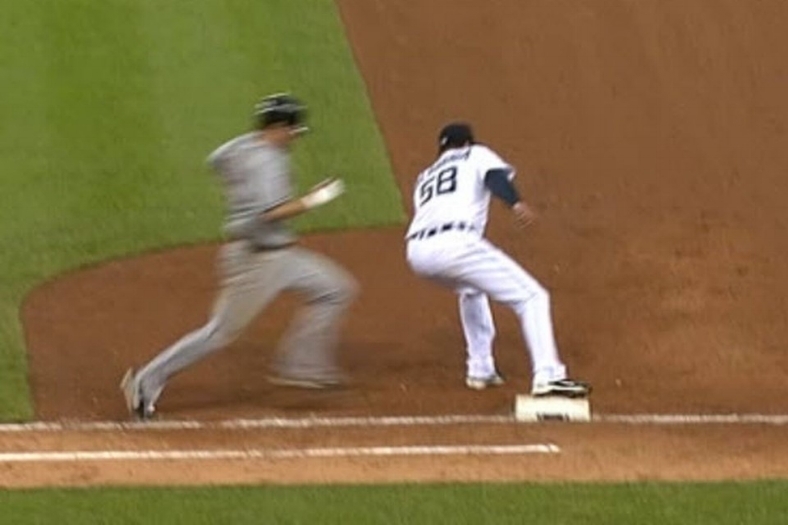 Angle One: Galarraga clearly reaches base before runner Jason Donald. Angle Two of Galarraga making the third out. Angle Three: Perhaps the best angle of Galarraga reaching base before the runner. Any fan of any professional sports team will tell you that Armando’s response was not “normal” for a pro athlete; those who are well-known for their spoiled, barrel-chested outbursts of anger. What is “normal”? Yelling. Cursing. A 5-minute tirade. A post-game press conference criticizing and belittling the umpire, while questioning his occupational competence. Since the call was not overturned, the game resumed. Armando retired the next batter, completing the one-hitter, though many in the Tiger press prefer to call it "the 28-out perfect game.” The game was officially over. It was too late to correct the record book. There would be no perfect game that night—or any night—for Armando in baseball’s records to this day. Upon watching the play on video later that night, umpire Jim Joyce now saw the play that he got wrong. He felt sick, stating, “I took a perfect game from that kid over there who worked his a** off all night.” He issued a direct apology to Armando, saying that the call was incorrect. Armando accepted the apology and the umpire’s acknowledgement of the mistake gracefully, simply stating eight short words to reporters later: "Nobody's perfect. Nobody is perfect. Everyone makes mistakes." Galarraga consoling umpire Jim Joyce 24 hours after the blown call that not only costed the pitcher a perfect game, but also brought many death threats to the umpire. to the same umpire; consoling him during what must have been a humiliating reunion. The umpire broke out in tears for Armando’s simple act of kindness and forgiveness. In the days ahead, Armando was presented with numerous sportsmanlike awards, and even appeared at ESPN’s ESPY awards show—alongside umpire Jim Joyce—to present the year’s Best Moment in Sports award. I once drove over 800 miles (and burned up a motor in my car) to watch one playoff game in Chicago by my all-time favorite basketball player, Michael Jordan. I also drove hundreds of miles—twice—to watch my all-time favorite football player, Barry Sanders. But years from now, if I’m ever asked on my deathbed who my all-time favorite baseball player was, I already know how I’ll answer: Armando Galarraga.